Kangana Ranaut celebrates her 32nd birthday today and the occasion deserves some celebration. 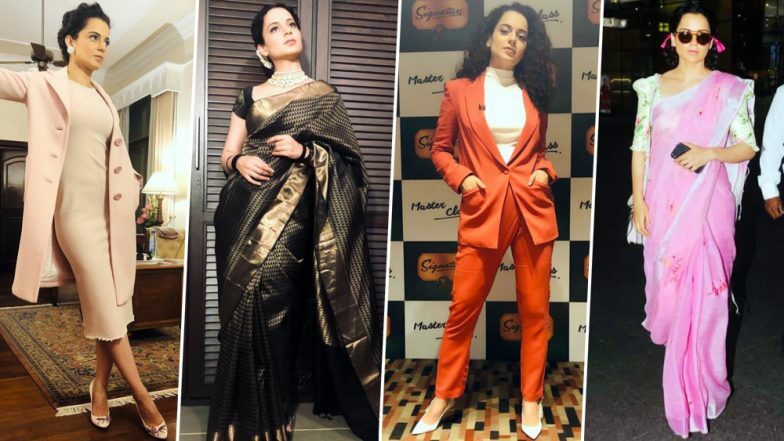 The 'Queen' of Bollywood who's relishing the recent success of Manikarnika: The Queen of Jhansi is a fashionista who knows how to carry herself. She can pair sneakers with her cotton sarees and make it the next big trend in the world of fashion. Or she can simply sizzle in a Sabyasachi creation and make you fall for her like never before. On days when she isn't blowing your minds with her acting chops, she's busy working on her style file that's chic and sometimes easy to attempt. Kangana Ranaut and Richa Chadha's Panga Will Hit the Screens on January 24, 2020. Her love for sarees cannot be even and we are glad for she believes in flaunting her love for such traditional silhouettes. However, nailing modern cuts and bold necklines is equally easier for her. From red carpet attires to promotional outings, there's seldom a day when she goes wrong with her #OOTDs. They are usually on point and oh-so-ravishing. Don't believe us? Check out some of our personal favourite fashion moments by her that are drool-worthy and a trend in itself. Kangana Ranaut to Take A 'Vow of Silence' Ahead of Her 32nd Birthday; Here's Why. Kangana takes her fashion game damn seriously. With the help of her ace stylist Ami Patel, she channelises the inner fashionista in her to come out and rule the glamour world like no one else. We adore this beauty and we suggest you join the bandwagon too. Here's sending her loads of love on this special day and lastly, Happy Birthday.